I have read recommendations to lock both the bike's frame and wheel. That's quite easy to do on larger racks, such as Sheffield stands. The place I work in, however, has a floor mount rack to store bicycles, with semicircular shaped supports. If I park the bike with the rear wheel on the support, the derailleur gets a bit bent, which I believe may damage it (am I wrong?). If I park it with the front wheel, my U-lock will only manage to lock the wheel, which is not a good choice since it's quick release. Under these circumstances, is there a technique to securely lock it without damaging the bike? The rack I mention is similar to the one below, but it has no bolts. In a situation like this, I usually don't fit any of the wheels in the support; instead I park the bike over the rack and just to the left or right of a loop, so that the lowest part of the frame is in close proximity with the loop. I then lock the frame and a wheel with a single cable (a U-lock might not work). Alternatively, you can place the rear wheel next to the loop (with the loop on the left side so it doesn't clash with the derailleur), and pass the U-lock through the wheel, straddling the chainstay and thus locking the frame as well. In short, just forget about the fact that the rack is designed to accommodate a wheel in a certain way. Use it as a piece of metal you can lock your bike to. Keep in mind though, that by parking your bike next to a loop, instead of in it, you're taking a bit more space and making it a bit more difficult for others to park. Something to bear in mind if the rack is often full. Also, as others pointed out, that doesn't look like a very secure rack. That doesn't necessarily mean you shouldn't use it; you choose how well you want to lock your bike depending mostly on how common bike theft is in your area, how attractive a target your bike is (especially in comparison to other bikes similarly locked), and how much risk of having to replace it are you willing to accept. I lock my bike on a rack just like this every night, but it's on a communal yard, not right on the street, and the bike is cheap. You definitely do not want to bend or misalign your derailleur, so you are right not to park your bike with the rear wheel in the rack. Your only option is to use a long, thick cable or chain to thread through the rear wheel, rear triangle, front wheel and rack. Using more than one cable or chain and adding a u-lock through the rear wheel multiplies the number of things that have to be cut. If you can leave locks and chains in place at work you wont have to carry them with you. 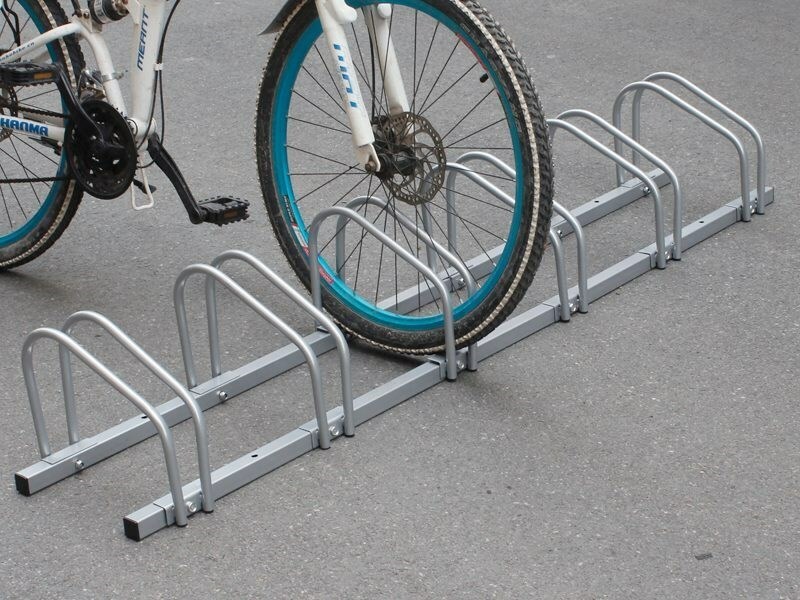 I hope the provided rack is somewhat more sturdy than the one in the example picture you posted. That one is not designed for security as the uprights can obviously be unbolted. If you want to lock up your bike securely you may want to look for an alternate location. For the longer term, ask your employer to provide proper bike parking. The device you picture is completely unsuited to parking bikes. As you've observed, it's impossible to securely lock your bike to them. If your bike is stolen, your insurance will refuse to pay up unless it was securely locked. Parked there, it wasn't. These racks damage wheels. Parked bikes inevitably get knocked and bashed and these racks put all of that force into bending the wheel. You mention that you don't want to just lock by the front wheel because you have quick releases. Unless you have some kind of security skewer, you shouldn't lock by the front wheel anyway: standard axle bolts can be undone with a spanner in seconds. Even with security skewers, you're relying on the thief not having the right tool, though admittedly that's a safer gamble. Use one lock to mount your front wheel to the stand, and another lock to mount your front wheel to your frame. You'll want both to be good locks for thiefs will need to cut only one of them to steal (most of) your bike. One thing you can do easily if you have to use this rack is to replace your QR skewers with security equivalents. I use pinhead because they came with my hybrid and I could get them for my tourer to use the same key. Just remember to keep the key on you if you might have to remove a wheel. My rather long D lock would reach half way to the frame, while securing the front wheel, so if I had a rack like this in work, I'd leave one lock there and carry another on the bike, using the two locks to form a chain. If that's a photo of your bike, you have several other small things to do. Its a folding bike, the protector below the Bottom Bracket tells me that. So fold it up and lock both wheels to the stand, or if its big enough get your D lock through the front wheel, through the back wheel straddling a stay, and then into the rack. I have a folder, and one simple defence is to simply slightly undo the main clamp and to lower the bars. Noone's going to be interested in a "damaged" bike with a whacking great bend in the main frame. Another option is to remove the front wheel and lock it beside the rear wheel - this works on non-folding bikes too. Downside is much more wear on the forks where they touch the ground, and disks tend to suffer alignment issues on frequent insert/removes. Finally you can always NOT use this rack - fold your bike and take it inside with you. Its not a problem until someone complains - "ask forgiveness, not permission" but don't block anyone's way or any fire escapes, and don't drop oil/grease/water anywhere inside. I frequently have to park a bike "backwards" in this kind of stand, i.e. with the rear wheel in the stand. Then, I lock the rear triangle to the stand, which might be a bit fiddly depending on the length of your lock. If there is no better spot to lock your bike, this might work for you. Note that, depending on the stand and your bike, there is a simple fix for the risk of bending your derailleur (hanger) that is mentioned in the answer by Argenti Apparatus: Shift to the smallest cogs before putting your bike into the stand. On the stand where I lock my bike, this leaves one or two centimetres of space between the stand and the derailleur. However, you might run into clearance issues with your disc brake rotor, if you have one. So be careful if you first try this method! If you find yourself in the company of a halfling and an ill-tempered dragon, remember that you do not have to outrun the dragon; you simply have to outrun the halfling. Likewise, when locking your bike, you don't have to lock-out bicycle thieves, you just have to out-lock the other bikes. If a thief is hell-bent on stealing your bike, they will bring a portable grinder with a diamond blade. But thieves rarely do. That is because they're creatures of opportunity. They will usually steal for maximum profit with minimal effort and risk. Since your front wheel is quick releasable, lock that to your frame with a good U-lock. If you're worried about your back wheel, get a second U-lock and lock that to your frame as well. Yes, that means your bike can be picked up and carried away, but that involves more risk to the thief since they will be recognisable as stealing a bike for longer. Are there any locking options that lock the drive train of a bicycle? How to lock up a bike with a rear wheel lock?